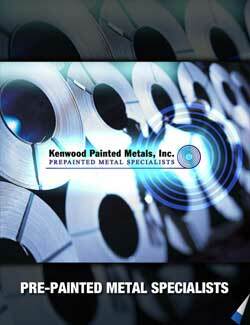 Singular focus makes all Kenwood Painted Metals clients a top priority. Kenwood Painted Metals has evolved to supply goods for a range of industries, including parts and accessories for the transportation industry, appliances, office furniture and HVAC systems in the consumer market to lighting fixtures, roofing, exterior walls and doors used in construction field. Part of Kenwood’s market penetration stems from its approach to service and adherence to convenient and cost-effective methodologies that are also environmentally sound. The company functions as a relatively small family enterprise where trust and respect have permeated through all staff. Underwood is both a chemist and craftsman, as well as a father who takes pride in working with family members and emphasizing relationships when it comes to customers, too. Kenwood specializes in coil coating, a process in which a base metal is unwound, cleaned and rinsed. After a chemical pretreatment, the metal is again rinsed to prepare the surface for coating. A primer is followed by a top coat specifically tailored to client specifications. The metal can be coated on one or all sides, in the same or different colors, and after each coating, the coil is cured in an oven. The metal is then recoiled and slit to width or cut to length, or laminated or embossed. The precision application of paint allows for a more controlled thickness than other techniques, which reduces cost. And, because coil-coating lines run at high speeds – some at 600 to 800 linear feet per minute – efficiencies are gained as well. Additionally, Kenwood’s coil-coaters include water and air pollution equipment to meets federal, state and local environmental requirements. The company has recently expanded into offering roofing systems that are coated with a paint possessing higher solar reflectivity than conventional paints, which yields reduced utility costs. The materials contribute to LEED points consistent with standards set by the U.S. Green Building Council. A long-time company tenet has been partnering with industry to identify processes that will benefit all parties involved. Its relationships include the National Coil Coaters Association, the Door and Access Systems Manufacturers Association and the National Frame Building Association. “My father said, ‘You’re going to do what?’” he said. The transition came shortly after Marathon Oil had acquired U.S. Steel’s supply division, which prompted Underwood to ponder new alternatives because the post-acquisition future was uncertain. In fact, he partnered with a former supervisor from U.S. Steel to begin the new enterprise, and a handful of Kenwood’s initial customers were ones who had maintained relationships at the previous employer. The new business thrived because of an ability to access any kind of coating needed, along with efficient order processing and inventory functions.